If the world isolated the U.S. with sanctions, could the U.S. survive? It’ll be fine … eventually. 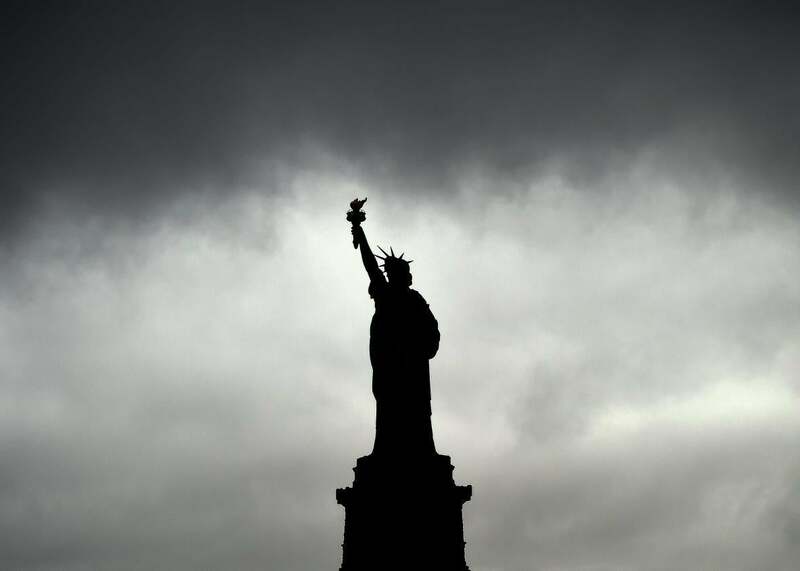 Above, the Statue of Liberty in 2014. Of course the U.S. could survive, but it wouldn’t be easy, and it would require a rewrite of how the U.S. does business and makes money. It would cause the U.S. to go through a complete economic collapse and rebuild as an isolated economy. I say this because I don’t want my next statement to be misunderstood. The U.S. is one of the few nations that, push come to shove, could “do it alone.” I don’t know how it would work out, but the U.S. has more than enough to supply itself with everything it needs. The first generation (20 years) would require the U.S. government to take a massive role in restructuring the economy to keep the nation from collapsing. The first thing that Americans would note is that textiles and cheap-to-make things would immediately disappear from shelves. The U.S. government, freed from paying any debts to the outside would, would have to take on $2 trillion to $5 trillion in debt to invest in local American textiles, semiconductors, and more to begin remaking our energy supply grid. The U.S. would have to quickly convert from any petrol-based electricity production to coal, nuclear, and renewable. If the U.S. forced every building south of the Mason-Dixon line to have solar cells, built 50 more nuclear power plants, and likely an equal number of coal-powered plants (a World War II–style emergency reshuffling, with Congress granting the POTUS emergency powers to force this—overriding all sorts of bureaucracy), in 10 years the U.S. could make this leap. The U.S. could totally survive isolated, but I cannot imagine what it would look like. Nothing short of a many-trillion-dollar investment in remaking the economy would allow the American people to have a life even remotely similar to what they have now, but even then, I don’t know what it would look like. The world would suffer more, in the long run, than the U.S.. There are a list of nations (South Korea, Philippines, Japan, Australia, Canada, New Zealand, the U.K., France, Germany, the Netherlands, Belgium, Italy, Greece, Israel, Saudi Arabia, Kuwait, the UAE, Qatar, Bahrain, Spain, Portugal, Poland, Estonia, Latvia, Lithuania, Ukraine, Georgia, Azerbaijan, Mexico) that would never join any U.S.-targeted sanctions under any circumstances, as their entire political and strategic security is dependent upon a strong, militarized United States. Some of them so overwhelmingly depend on the U.S. for their security (the U.K., Australia, Japan, South Korea, Poland, the Baltic states, Israel, Saudi Arabia, Kuwait) that they would take up arms to oppose such a measure. The world would also fall into military chaos and trade depression. The world depends, for better or worse, upon the American economy to act as a fuel supply for capital investment. Venture capital in the U.S. drives innovation around the world, and there is no replacement for that on the horizon. Hypothetical battles: If every nation in the world allied and attempted to invade and conquer the United States, would they succeed? Hypothetical battles: In a hypothetical air-to-air combat, who is superior: the best of the USAF vs. the best of the US Navy? The United States of America: If every state of the USA declared war against each other, which would win?